Mi-2 bord 211, which is getting dangerously close to its airworthiness certificate, got a new set of blades today. A lot of Mi-2s in Europe are receiving composite blades so there is a plentiful supply of used, but nearly new, metal blades. The blades put on 211 have very few hours on them. At dusk, when the wind was at a minimum, we balanced the blades the old fashioned way. A long non-metal pole with a roll of paper in the end is brought to touch the rotor arc. Each blade tip has been marked with a different color of chalk and each leaves a mark on the paper. Examining the marks lets you figure out which blade is riding high or low. To our pleasant surprise, the new blades on 211 tracked absolutely true right out of the crate. This was confirmed by the pilots who said that it felt really smooth. The pole has to be brought up to the rotor arc very carefully. Aviation students from Skyline High School were out Saturday participating in the CWAM "MiG Mechanic Apprenticeship Program". 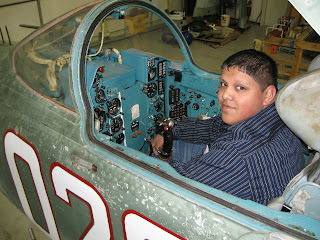 Ok, we don't really have a MiG Mechanic Apprenticeship Program, but we can use all the help we can get! Sammie was back out to the museum this weekend and brought reinforcements. The MiG-23 has new engine oil and the panels that were off for assembly are going back on. It's meticulous work... screws for each panel have to be located and matched for type, paint and length. Each screw is given a little dab of oil before going back on so that removing it later will be less of a challenge. About a year ago, the museum received a hydraulic mule as a donation. It has everything you'd want in a mule: dual systems, high pressure and flow with control over each, and filters so that contamination in one aircraft doesn't migrate to others. The mule, aka "Smurfette", needed quite a bit of work... new electrical cable, new filters, and new hoses and fittings. Sometimes when things are donated you wonder what might be wrong with them. Well, today we found out what's wrong with Smurfette: Cracked pump housing. Really sprayed fluid like crazy when we turned it on. Cracked isn't the half of it... the end cap on the housing is completely busted into three pieces. No worries, tho', looks like there are plenty of places to get Dowty pump replacement parts on the net. The tug, which is needed to move the Mi-24 and the MiG-23 because they're so heavy needs a hitch in the front. Here, Todd is working the front of the tug to prepare it for the hitch attachment. When kids visit the Cold War Air Museum and see the MiG-23 for the first time they invariably ask, "How fast is it?" While the short answer is "Mach 2.35," that doesn't really give you a feel for how insanely, crazy fast that really is. So we've taken to explaining that at Mach 2.35, the MiG could travel from Dallas to Houston (about 240 miles = 4 hours by car) in just over 9 minutes. And the answer to the second question, "How much gas does it burn?" is (of course), "ALL OF IT!" But that's not the full answer, which has a lot more to do with how high you want to fly and how much Jet-A you want to burn. The long answer is this chart, relating altitude and maximum indicated airspeed at the various wing sweep angles of 16, 45, and 72 degrees. There are a couple of things to read from this chart. First, maximum airspeed at full forward sweep of 16 degrees is Mach 0.8. With the intermediate sweep of 45 degrees and the belly tank, Mach 1.6 is the limit. And with any external stores 1.8 is as fast as you can go. Moreover, at 45 degrees you're not going faster than 1,200 km/hr (648 KIAS) because that's the maximum design airspeed for that wing sweep. Maximum indicated airspeed is 1,350 km/hr (729 KIAS). Second, altitude is restricted by airspeed. If you have to stay under Mach 1 (and, alas, you do) then the static ceiling is about 13.5km (about 44,000 feet). Assuming the FAA would consider letting you make a "BOOM!" stretching from Dallas to Houston, indicated airspeed is still limited, so you can't really get zorching until you're over 10km (about 33,000 feet). Finally, temperature limits maximum altitude. On an ISA day (15 degrees Celsius), the MiG-23 will top out at 17.5km (about 57,000 feet). On a colder day you can go higher, but on a day that's ISA+15C the ceiling will be 12.5km (about 41,000 feet) and you won't be able to make Mach 2.35 since you'll run into the 1,350 indicated airspeed limit. Mallory is a CFII/MEI who's been wanting to get involved in the museum. She came out a few weeks ago and we just happened to have an empty back seat when the L-39s were going up for some formation work. Lucky her! She made this video of the flight and sent it to us. Thanks Mallory! With an impending Texas ice storm looming outside it was time to put the tail on the MiG-23. Just roll the tail dolly up and slide it on, right? Yeah, right! A little closer maybe not so easy. One centimeter at a time... and then check all the connectors (there's about a dozen of them) to see which one is going to hang up. Then start tightening down all the bolts, all 25 of them. Special tool just for pushing the exhaust pipe up against the engine, very gently! And a come-along on the bottom and we're all set. Stabilators slipped right on... that was easier than it was supposed to be! Really starting to look like a supersonic interceptor. A goodie box of parts arrived from Poland today. Metric nut plates, new hinges and window seals for the Mi-2, many metric aviation screws, and the Mother of All Torque Wrenches for the Jesus Nut on the Mi-2. Here Bruce is seen thinking, "You think that's a torque wrench? Now this is a torque wrench!" Dave, who did most of the original artwork for the Cold War Air Museum web site recently sent over a new footer graphic. Since Dave lives in Australia, this definitely proves that you don't have to be at the museum to be a volunteer. Thanks Dave! 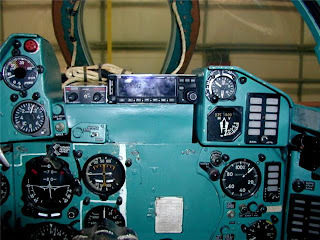 Proposed location of a Garmin 250/300 and audio panel for the MiG-23 per Bud's experiment over the weekend. The North Texas Association of Aviation Museums meeting was hosted by the CAF DFW Wing at Lancaster. After the meeting, a group came over to visit the Cold War Air Museum. Sammie Perez, a student at Skyline High, a Dallas magnet school that has a Part 147 FAA A&P training program, took some pictures and sent them to us. Thanks Sammie! 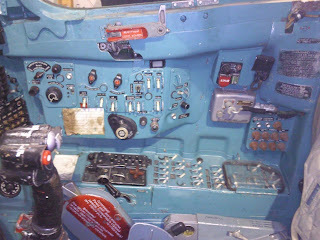 We haven't posted cockpit pictures of the MiG-23 before. 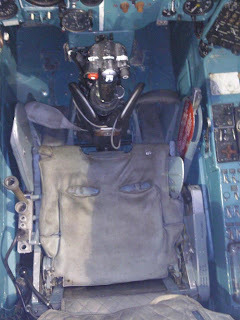 Update: Here's Sammie in the cockpit of the MiG-23. Vertical stabilizer attached to MiG-23 tail section. Once that's on, all the shrouding can be replaced and the tail pipe re-inserted. We were told by our friends in Poland that compared to slipping the engine in to the airframe, getting all the pins to fit on the vertical stabilizer was going to be "much harder". No kidding... things fit precisely. And nothing sissy about getting the parts to fit, either. One of the mechanics asked for a hammer and we got him one of the usual ball-peen variety. No, no, that wasn't big enough. So we located a serious hand-sledge. "Ahhh!" he said, obviously pleased with the massive Persuader, "Russian Hammer!" 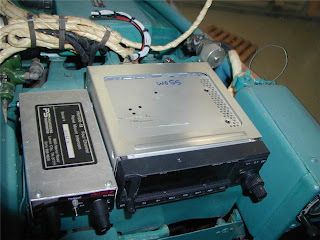 To someone who's used to the huge bundles of wires in western aircraft, the amount of equipment needing connecting in the MiG is surprisingly spartan. We like it that way... less to get wrong. Someone once said, "Communism: Lousy Politics, Great Aircraft!" The MiG-23 vertical stabilizer is held on by three pins. One towards the front and two in the back. To our horror we couldn't find one of the rear pins. We looked everywhere, but no luck. As keeping the rented ground equipment past the end of the month is a non-option, we started getting pretty anxious. But "no worries!" ... it turns out that the pin that holds a Mi-24 winglet on is exactly the same pin that holds on the vertical stab. of the MiG-23. We had one in stock. Three cheers for Central Planning! Over the years we've noticed that Soviet aircraft are basically made out of Legos. It's as if someone went to the designers and said, "Build us an attack helicopter... using these parts. Now build us a supersonic interceptor using the same parts." 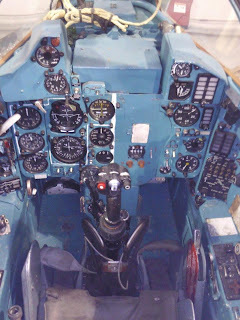 We've seen that the electro-pneumatic valve used as a starter in the CJ-6A piston trainer is the same valve as is used in the ejection seat interlock mechanism in an L-29. 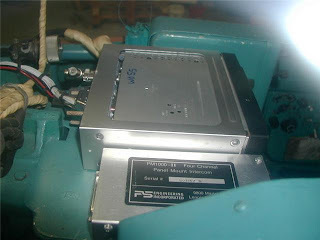 The same brake actuator is used, either hydraulically or pneumatically, in practically every aircraft. Moreover, the parts that make the parts are the same. So when something like this needs to be attached, naturally you would use the same attachment mechanism. It was probably manufactured at the People's Wing Bolt Factory. Before the vertical stabilizer can be attached, the tail cone must be removed from the tail section. It's the only way to get to all the connections for the stabiliators, etc. Having the right ground equipment really helps. Add an attachment to the engine stand and presto-chango, it becomes the tail cone manipulator. 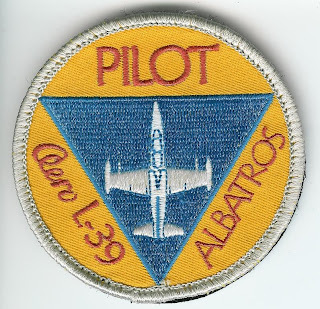 Several years ago, some mechanics from the Aero Vodochody factory in Prague gave us a few of what they said was an L-39 factory delivery patch. Museum pilots wore them on their flight suits until the patches were ragged. We thought the patches were so nice that we eventually had copies made. Since the minimum order was 100 patches, we put the rest up for sale in the museum store for $5.95 (free shipping). Buying a patch supports the museum's activities. One of the frequent problems with working on soviet-block aircraft is replacing screws and nutplates that become "frozen". When that happens, we have to drill them out and replace them. Some blame the bad weather where the aircraft come from, most blame the quality of plating used on their threaded metallic fasteners. Brad and Todd built a wheeled cradle to assist with moving the MiG-21 from the storage hanger to the maintenance hanger. On the left, they are shown holding the tow straps while the tug is being repositioned. On the right, the aircraft is in the maintenance hanger, but it will have to wait a little longer until a work area is set up for it. As covered in the story about #211 (see previous Mi-2 posts), the bottom skin of #214 must also be replaced. The picture on the left shows an area where corrosion has eaten all the way through. The fuel tank (bladder) has already been removed from the aircraft and after an inspection of the compartment and structure, the extent of the area to be repaired will be determined. 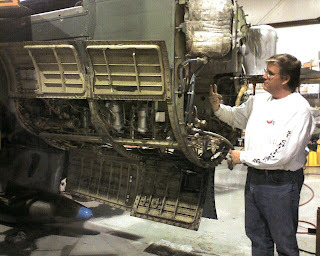 A special ladder, part of the ground equipment, makes access for cleaning and inspecting the engine compartment easier. The engine stand allows the engine to be rolled up to the aircraft where rollers on the engine engage a track to assist in moving it into the engine compartment. A generous assortment of panels allow for inspection and attachments during the procedure. Brad is seen inspecting Jon's cleaning work on the MiG-23; he'd use a pair of white gloves for this job, but he doesn't want to ruin a perfectly good pair of white gloves. Brad believes that somewhere under several layers of grime is a jet fighter formerly belonging to the Soviet Union... but he has yet to see it. In other news, we've confirmed that the Mi-24 hydraulic mule connection fittings that we have will work on the MiG-23. Central Planning - maybe not so good for countries, but great for aircraft! Q: How do you lift a 5,000 pound Tumansky R-27F2-300 turbojet engine into its stand (when you're not really sure what you're doing)? We lifted one end with the A-frame hoist borrowed from the CAF and the other end with the forklift. It came up out of its shipping stand just an inch at a time. We kept the camera rolling... if we dropped it, we definitely wanted that on video! The "conservation" oil that was placed in the engine before shipping is amazingly slippery on the hangar floor. Cleanup is a must! Here, Jon, Bruce and Roma are shown doing the famous CWAM "Ragfoot Shuffle". Once on the stand the engine can easily be moved around. Adjustments allow each corner of the engine to be lifted slightly differently and a winch precisely controls the movement of the engine when it's put into the back of the MiG-23.